Howe is among the most articulate and inventive writers we have, and cements her eminent position in a lineage of pedagogical poets of the United States. She instructs by intuitive connections between disparate strands. Her books continue to reveal possibilities in the most out-of-the-way texts. This library cormorant and her daring trespasses remain as shocking and singular as ever. 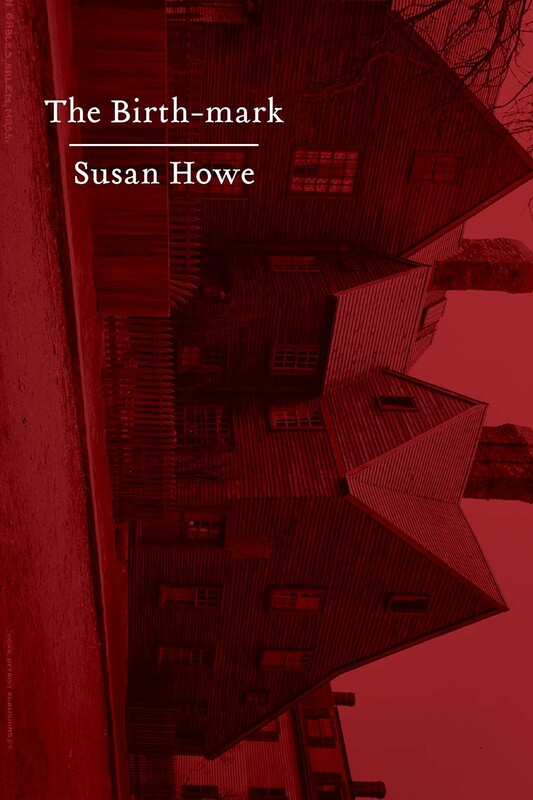 In this classic, groundbreaking exploration of early American literature, Susan Howe reads our intellectual inheritance as a series of civil wars, where each text is a wilderness in which a strange lawless author confronts interpreters and editors eager for settlement. Howe approaches Anne Hutchinson, Mary Rowlandson, Cotton Mather, Hawthorne, Emerson, Melville and Emily Dickinson as a fellow writer—her insights, fierce and original, are rooted in her seminal textural scholarship in examination of their editorial histories of landmark works. In the process, Howe uproots settled institutionalized roles of men and women as well as of poetry and prose—and of poetry and prose. The Birth-mark, first published in 1993, now joins the New Directions canon of a dozen Susan Howe titles. We workday scholars must not be intimidated by this scholar-poet”s fierce critical exactitudes. Howe”s is a critical model for our schooling, a procedure and an ethos well worth study, opposition, imitation, revision. “I am heading toward certain discoveries.” Not knowledge, or what Howe so brilliantly explores under the name “Sovereignty,” but exploration. The fabled violence of American patrimony is here tracked and qualified by brilliantly perceptive readings. Susan Howe, herself “a library-cormorant” in Coleridge”s phrase, brings to her task the powers of a major poet and the adamant measure of the “Other” she, as all women, have been forced to be. This remarkable book is vivid testimony of that voice we can no longer silence. The Birth-mark flashes out the figure of the Poet who stands behind Howe”s poems—a figure who is, I have come to believe, at the heart of her achievement—and it gives a spirited lesson in how important essays are. Invaluable—a reconnaissance mission in language and history. The Birth-Mark awakened me to the possibility of writing criticism wildly and wantonly, of bringing everything to the table, including history, research, politics, autobiography, imagination, obsession, and love. Invaluable….A reconnaissance mission in language and history. An astonishing work re-presenting the American past, its history, literature, texts, and critics. At once gnomic and lucid, grave and scintillating—passionate [with] fierce originality. As a poet and a critic she articulates precisely those soundings of uncertainty, those zones of failed or impaired utterance that constitute the literary history of America’s uneasy commerce with the word.